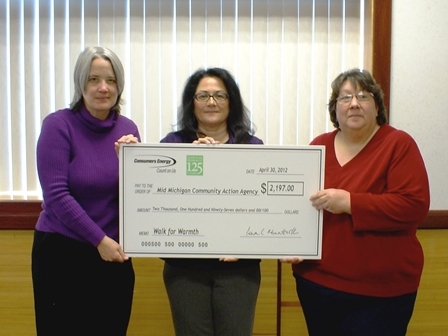 For 21 years, Mid Michigan Community Action has hosted Walk for Warmth in order to raise awareness of those in the community that go with little or no heat and to raise funds to help those in need. A long-time supporter, Consumers Energy has stepped up as a partner providing match funds, participating in the walk and supporting the event. Consumers Energy was able to match over $2,100 in Midland, Bay and Mecosta County and over $42,000 statewide. Consumer’s also provided $1,000 in event sponsorship and helped provide radio advertising through local radio stations. Across Michigan, over 800 employees and their families attended different Walk for Warmth events. In all, Consumers participated in 23 different events. Many of the 30 Community Action Agencies in Michigan hold Walk for Warmth events to raise awareness and funds. Walk for Warmth 2012 would not be possible without support from our sponsors from across mid-Michigan: Accu-Air Heating & Cooling, Boulevard Lounge, Buccilli’s Pizza of Clare, Chemical Bank, Climate Control LLC, Consumers Energy, County Connection of Midland, DTE Energy, Elm Creek Lawn & Landscape, Endless Journey Internet Inc., Martin Heating & Cooling, Messiah Evangelical Lutheran Church, Michael Oil & Propane, South Park Homes, Stanford L.P. Gas Inc., Timmo’s Wood Sales & Outdoor Services LLC, Trivalent Group Inc., Wolverine Bank, and Wooden Shoe Big Boys Club.